As a rule be very careful when swimming or playing in Florida's fresh waters, and don't do it at night period. 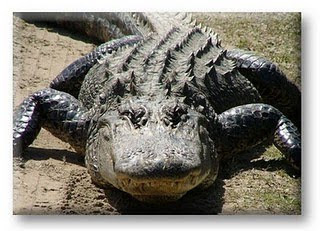 "Florida wildlife officials say a 10-foot alligator bit off a man's hand while he was swimming in a canal with friends. Ferraro says Delano was swimming with three friends around 9:30 p.m. Sunday when the alligator attacked.The men swam to shore and drove to a gas station, where they called 911. Delano was flown by helicopter to a hospital. Wildlife officials say people should stay out of freshwater canals and lakes this time of year because alligators are more active, especially around dawn and dusk." Story provided by the Herald Tribune.